"My first full-fledged musical instrument, it was keyboard instruments. I remembered that it was when I was in kindergarten. Then I started to play wind instruments at 7 years old. As a matter of fact, playing string instruments (guitar) is the latest and I had not touched string instruments until 10 years old." (JINMO) It is well known among JINMO manias that JINMO also plays other instruments than guitars. Although JINMO plays pipe (tubular wind instruments) before he started to play string instruments and he plays them in his show for JINMO manias, he had not released wind instruments albums differently from string instruments or keyboard instruments. Finally, at his 121st album, it is the advent of the opportunity to spread his real image of piping. 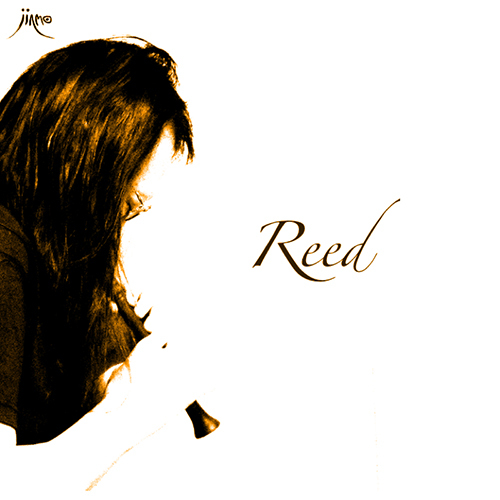 This album "Reed" is JINMO's very first album of wind instrument, and an accompanied solo album at that. The instrument he played is his favorite Georgian ethnic wind instrument that he got at Moscow on his 1997 tour in the former Soviet Union. This is a vertical flute-like appearance, but it has single reed as sound body like saxophone. Equipped with a cover for covering a reed part, and it has unique structure not to hold reed directly between lips. Therefore, it is possible to play fast tonguing just like a recorder playing. (It is also used frequently in this album) And the title of this album "Reed" has named from the structure of this instrument. In addition, the hole in order to control the pitch, even including hole for thumb on the back of instrument, there are just seven holes in total. Far from saxophone, holes are less than on a recorder for school children. Nevertheless, this album "Reed" is filled with unique playing technique by JINMO as a wind player such as free wheeling playing in very wide range and pitch change expression in legato like choking guitar. Highly accentuated the characteristics of reed instrument, the harmonics rich tone control is so beautiful and fascinating. This album "Reed" is JINMO's unaccompanied solo wind instrument album, it has miking the instrument sound and effect processed then recorded as it is. We recommend this album to contemporary music, edgy techno lovers and experimental music but also recommend to wind-instruments lovers. It has just 13 days passed since the release of previous album "Wolfbeat 2", JINMO's 121st solo album (102nd from Avant-attaqque) "Reed" is now available in Avant-attaque.